Hello hello! 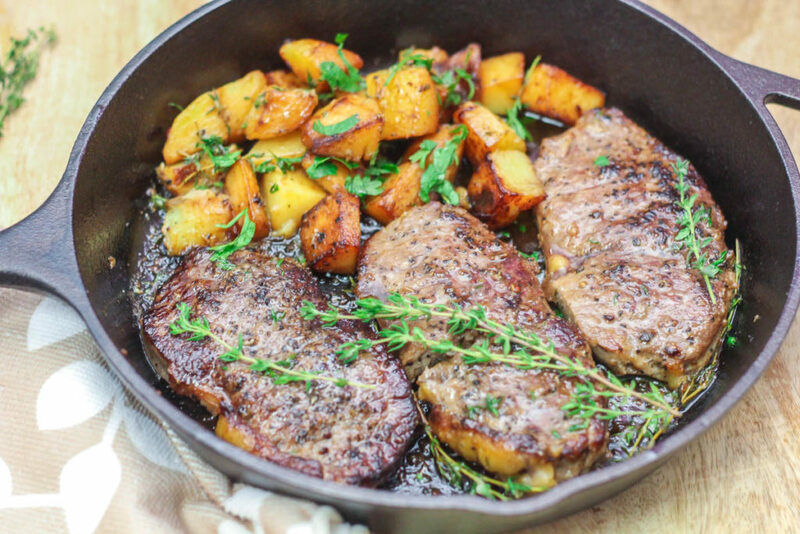 I am back with a delicious Garlic Butter Steak and Potatoes recipe for you guys. So how was the weekend guys? Mine was pretty laid back. Remember in the previous post, I mentioned as to how I was hooked on to Zumbo desserts on Netflix? Thanks to that show, I went on a not so little bakeware spree, buying silicone molds and different sizes of cake rings. Basically, I am inspired to bake more. Let’s hope that I stay inspired cause I am someone who needs constant motivation. Anyways, back to the recipe I am sharing today. I have to be honest here. I rarely eat steak. It’s not that I dislike it or something, but it is just that I am not able to find steaks that are accustomed to my taste, at least at the restaurants. The look of half done steaks scares me. I personally like my steak pretty neatly done. Yeah, I know you steak enthusiasts must be gasping at me. Hei, friends don’t judge each other remember? 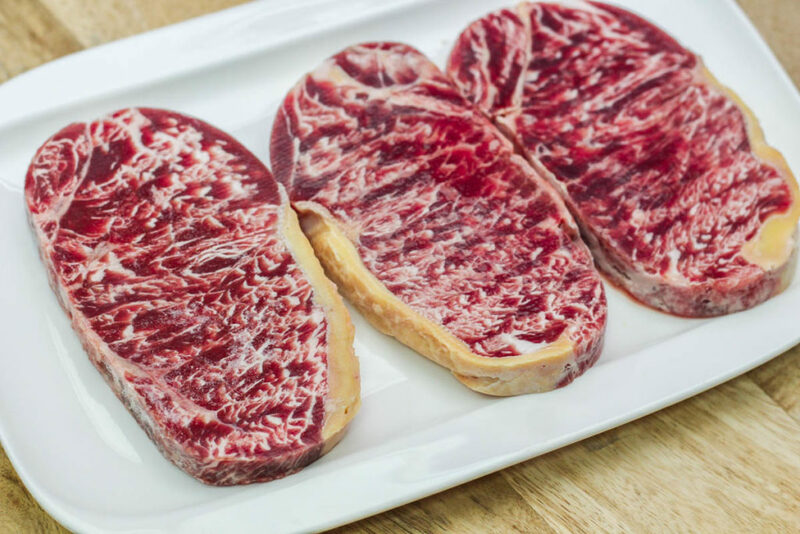 There have been 2 or 3 occasions when I purchased steaks from a restaurant, asked for well done and it was still too pink for my liking so I totally gave up on eating steaks whenever I go outside. I tried cooking steak once or twice but it was never really my kinda thing. She was all hyped about the steaks and went gaga over it which made me excited to give it a try! The steaks had really pretty marbling on it. I thought of ways as to how I should cook these beautiful cuts of meat and I was reminded of what I was told by Gordon Ramsay. “When you cook steak, it is best to go as simple as possible.” Don’t ask me when I and Gordon had that conversation. So, I had a game plan in mind. Simple but big on flavors. I decided on butter, rosemary and garlic. Basically, the winning trio. The steaks are topped with a garlic compound butter that is mind-blowing. You can put that butter on anything and everything from seafood to grilled vegetables. To complete the meal, I made some potatoes to serve as a side. So basically, you parboil the potatoes for a bit and then continue cooking it in a skillet/pan. Once they are tender, then you cook the steaks by the side. Slather all of that delicious garlic butter on both the potatoes and steaks. 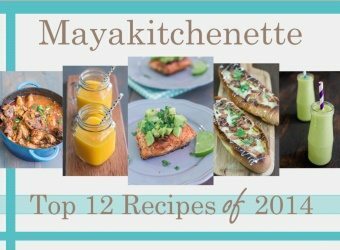 Easy peasy but super yumz! We really enjoyed the steaks that were cooked to tender and juicy perfection. Moreover, the butter garlic made it totally off the hook. 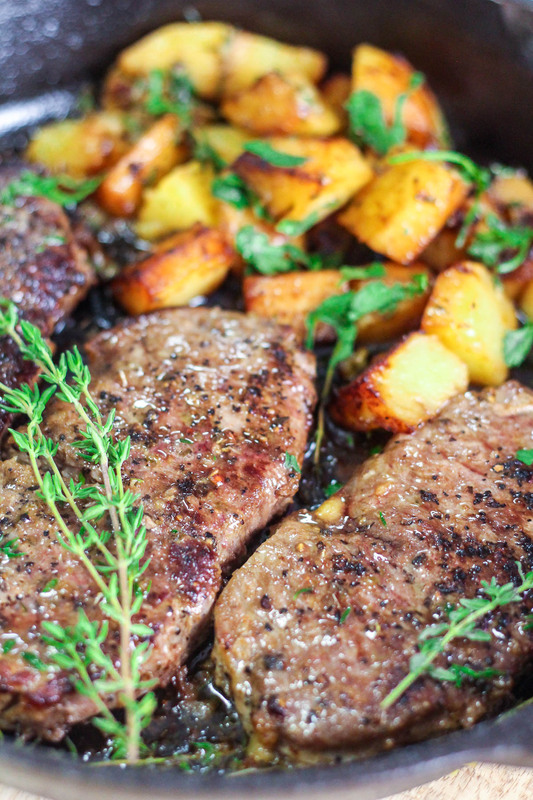 These Garlic Butter Steak and Potatoes are definitely gonna be a hit with all meat lovers. In fact, even the potatoes are AMAZING. We finished it off really quick! Give it a try lovelies! In a pot of lightly salted boiling water, par-boil potatoes for a few minutes till half cooked. 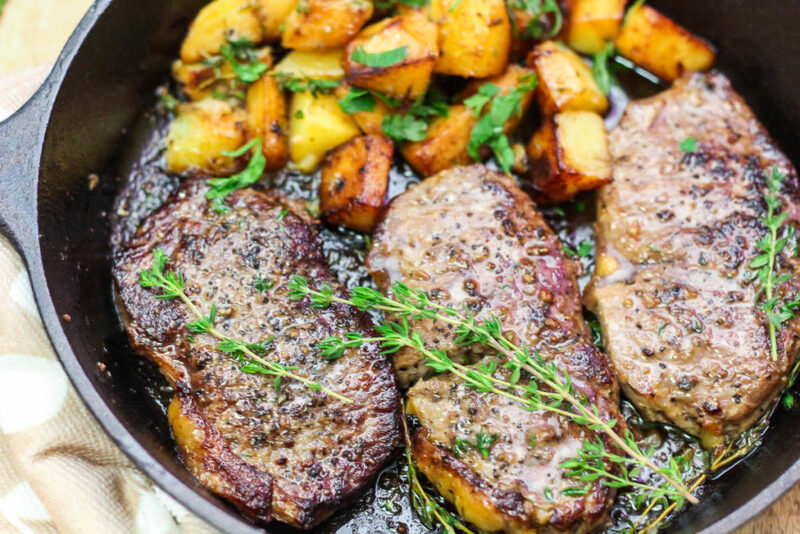 In a large pan/skillet over medium-high heat, add olive oil and butter, potatoes, thyme, rosemary, and oregano. Cook for about 5 minutes. Once golden and fork tender, remove and set on a plate. Turn the skillet to high heat and add the steaks. Cook on each side for 4-6 minutes, depending on how well done you like your steaks to be. Right before the steaks are done, place the potatoes back in the pan and slather the garlic butter on top of steaks and potatoes. Cook through for a few more minutes and let the butter melt into both the steaks and potatoes.